Fate: Sold for scrap 10 JAN 1947 to Patapsco Scrap Co., Bethlehem, PA for the amount of $67,228. 58k Starboard Bow view. From the collection of Gerald M. Charpentier of New Orleans, LA. Donated by his niece, Elaine C. Witty-Charpentier. Elaine C. Witty-Charpentier. 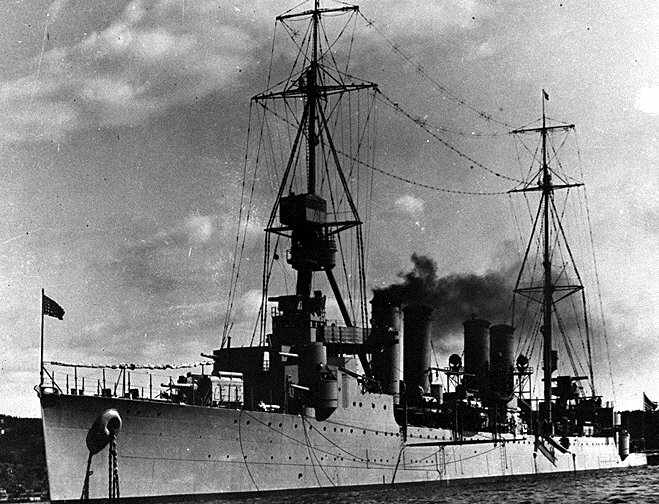 USS Memphis (CL 13) off Melbourne, Australia during a 1925 fleet visit. 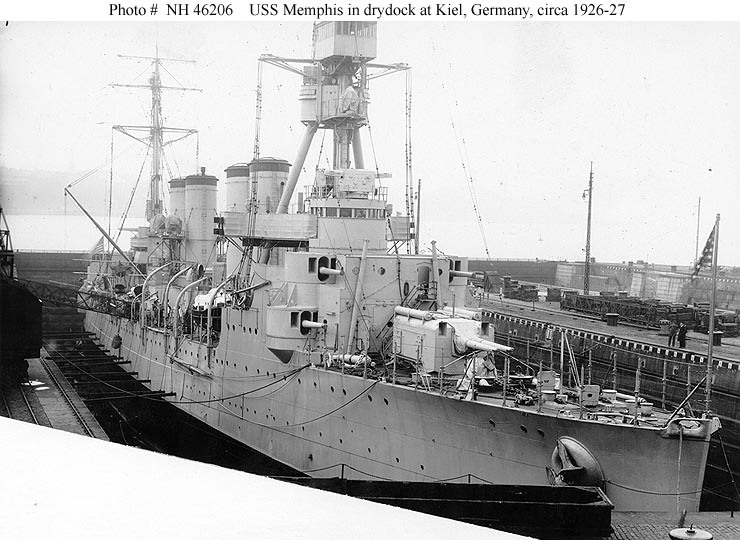 USS Memphis (CL 13) In drydock at Kiel, Germany, circa 1926-1927, while she was serving as flagship for Commander U.S. 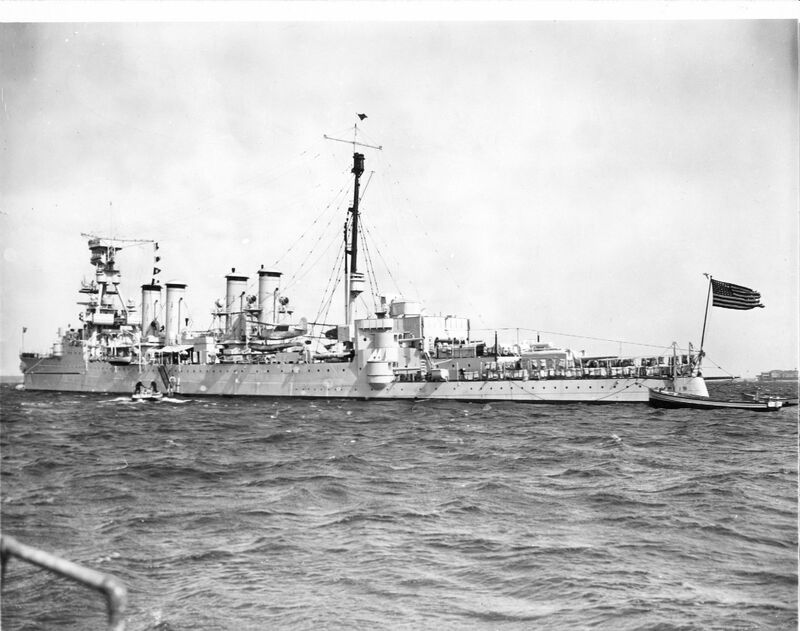 Naval Forces, Europe. U.S. Naval Historical Center Photograph #NH 46206. 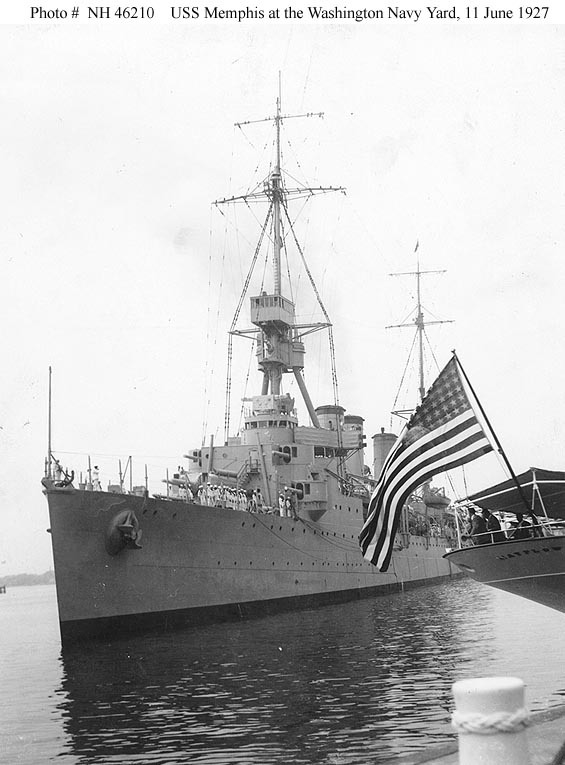 USS Memphis (CL 13) Arrives at the Washington Navy Yard, D.C., with Charles A. Lindbergh on board, upon his return from Europe to the United States after his pioneering trans-Atlantic flight, 11 June 1927. 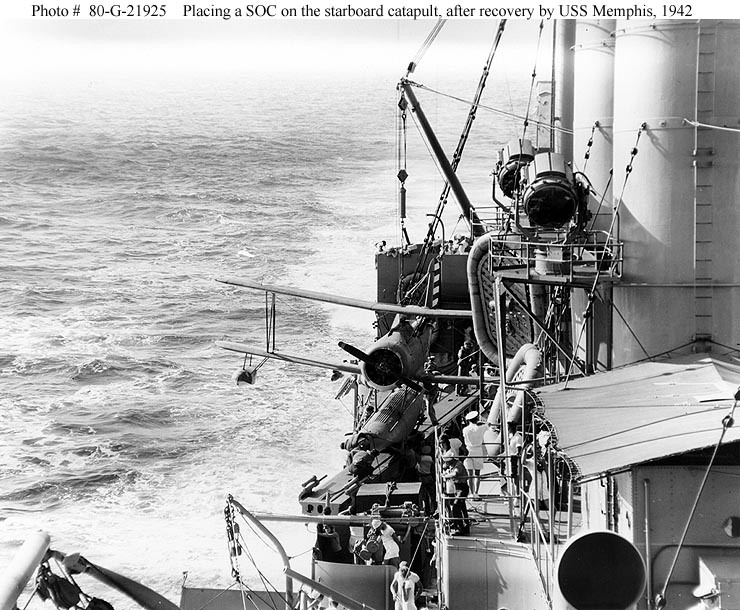 The stern of USS Mayflower (PY 1) is at right. U.S. Naval Historical Center Photograph #NH 46210. 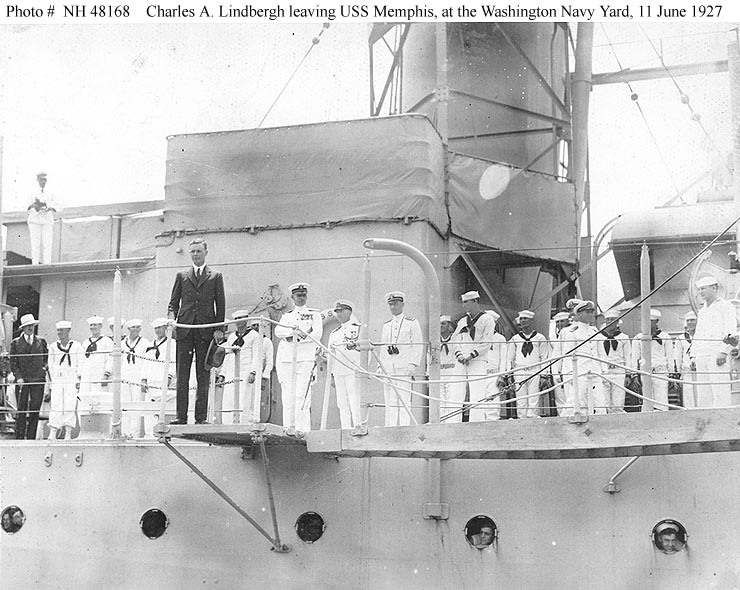 Charles A. Lindbergh - Prepares to disembark from USS Memphis (CL 13) at the Washington Navy Yard, D.C., upon his return from Europe to the United States after his pioneering trans-Atlantic flight, 11 June 1927. 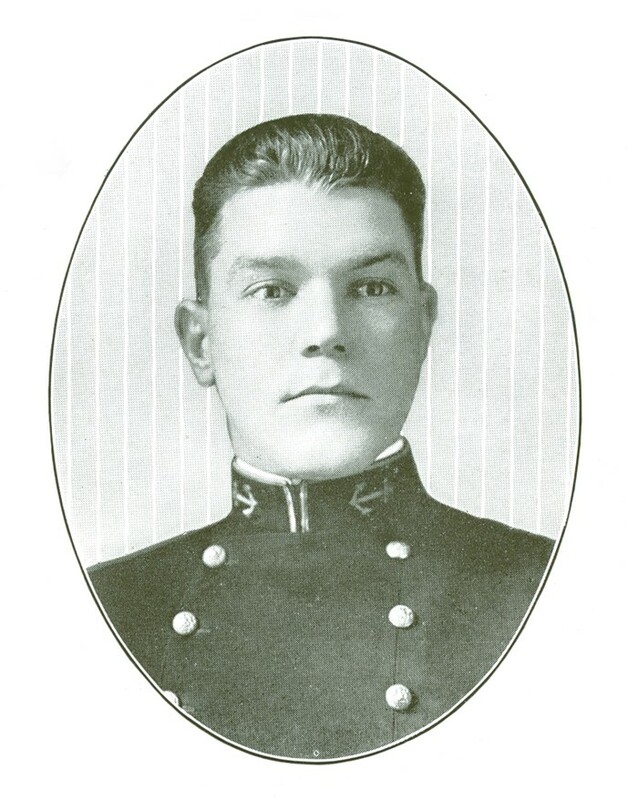 Officer standing behind him, to right, is the ship's Commanding Officer, Captain Henry E. Lackey. Behind Capt. Lackey is Commander Eugene E. Wilson, of the Bureau of Aeronautics. U.S. Naval Historical Center Photograph #NH 48168. 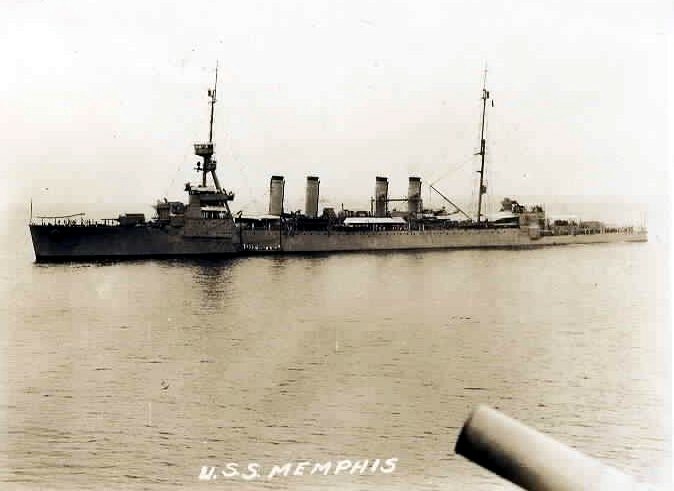 USS Memphis (CL 13) Photographed circa the later 1920s. 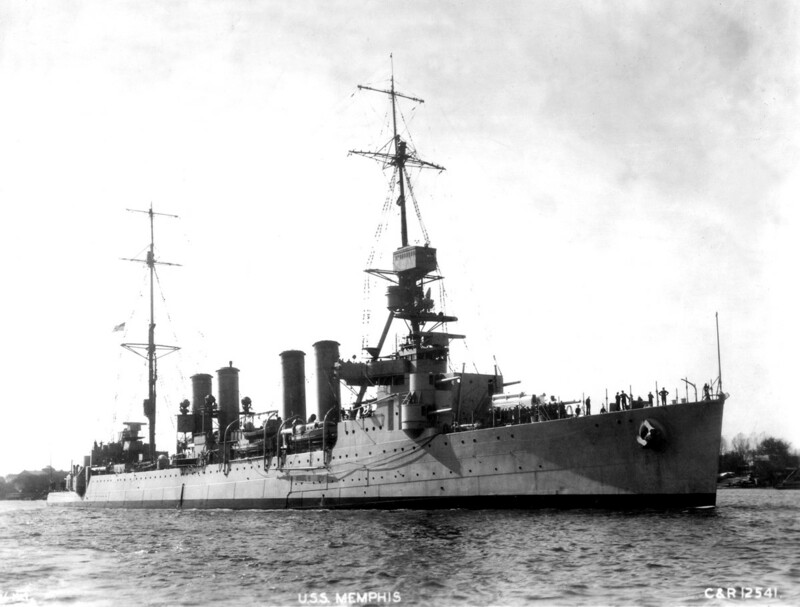 0401319 180k USS Memphis (CL 13) moored at an unknown location on 11 April 1927. 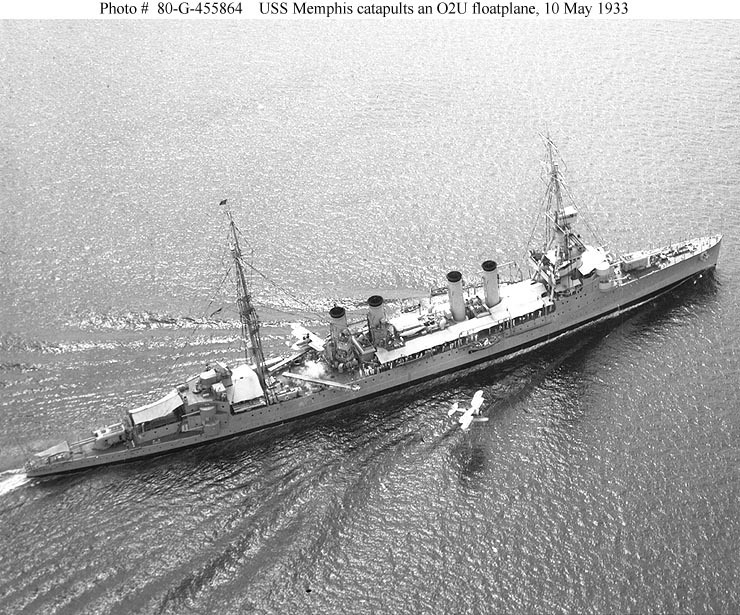 USS Memphis (CL 13) Catapults an O2U "Corsair" floatplane, during fleet maneuvers on 10 May 1933. 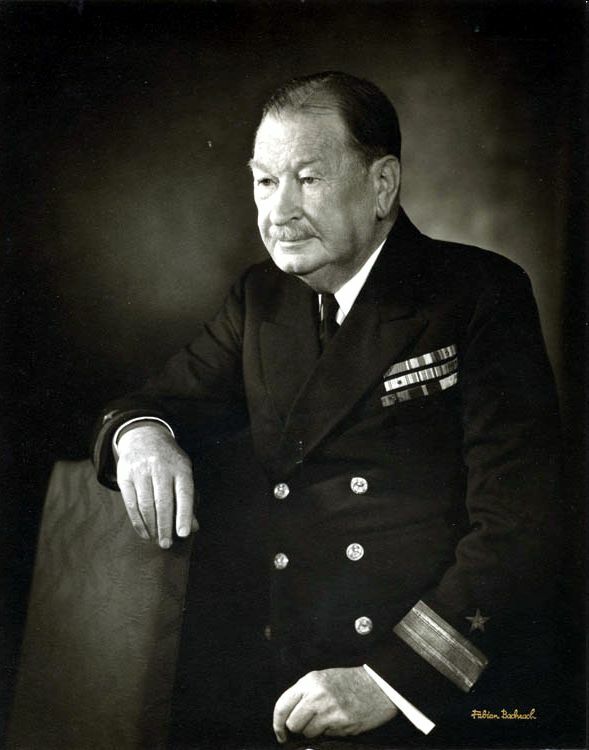 Official U.S. Navy Photograph, now in the collections of the National Archives #80-G-455864. 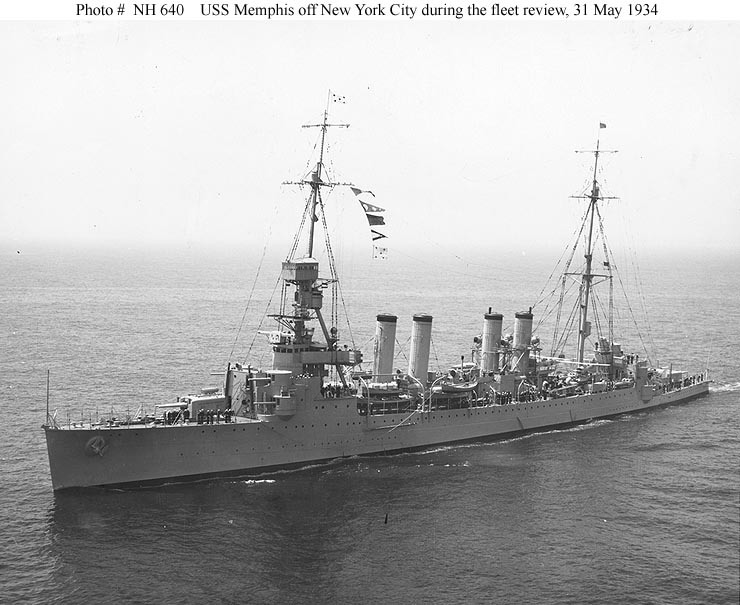 USS Memphis (CL 13) Underway off New York City during the Fleet Review, 31 May 1934. 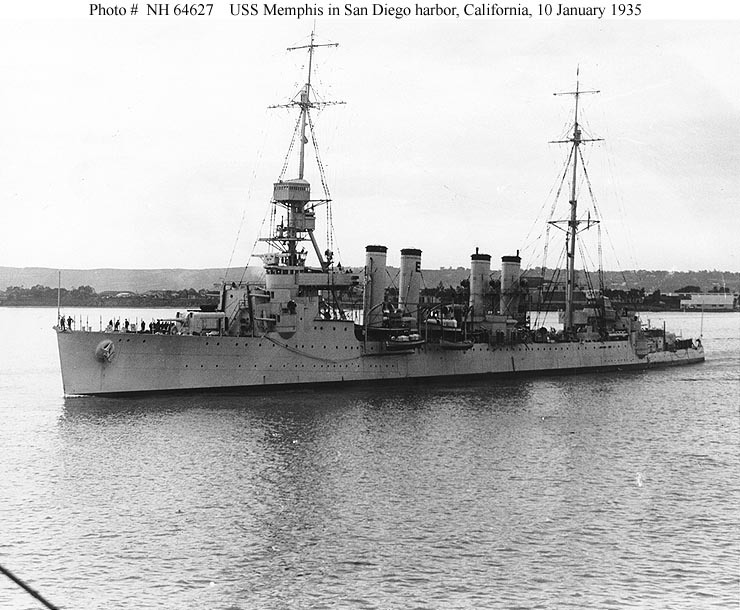 USS Memphis (CL 13) In San Diego harbor, California, 10 January 1935. Photographed from USS Dobbin (AD 3). Donation of Franklin Moran, 1967. U.S. Naval Historical Center Photograph #NH 64627. 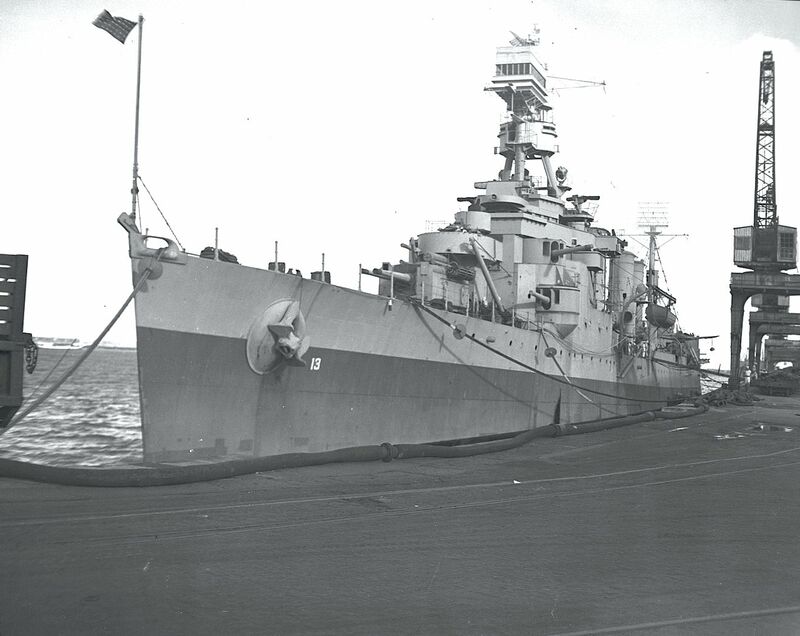 USS Memphis (CL 13) View on deck, looking aft from the bow while the ship was underway in the South Atlantic, circa 1941-1942. 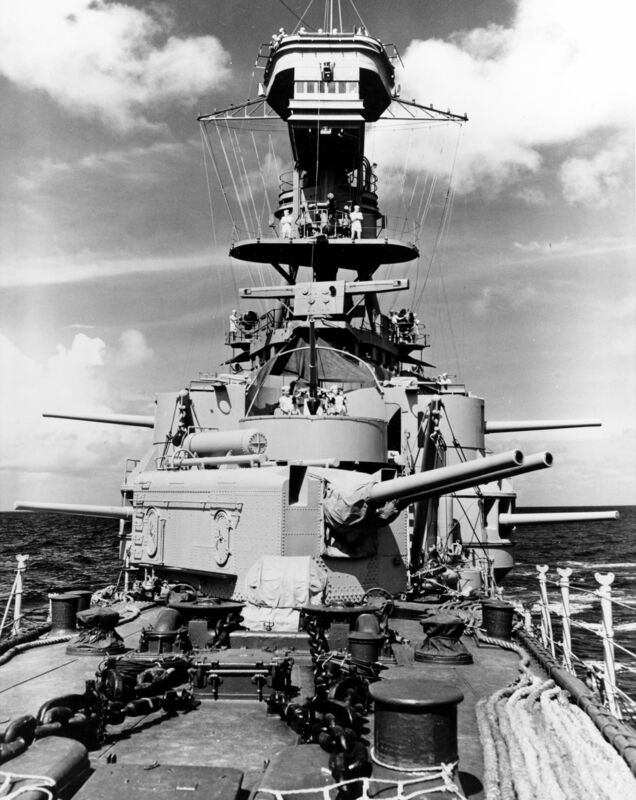 Note 6"/53 guns in her forward turret and casemate mountings, 3"/50 anti-aircraft gun behind the turret, rangefinders and other fire control equipment on the foremast. 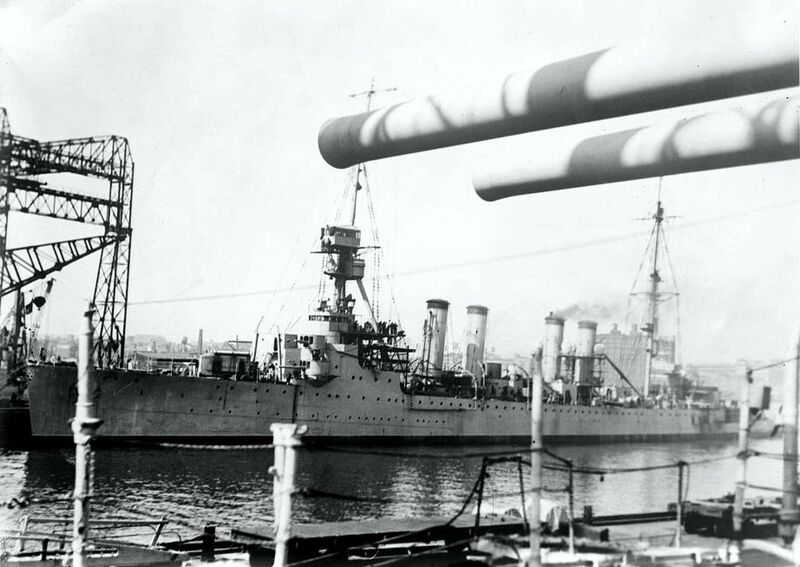 The cylinders atop the turret provide compressed air and water to the guns. Crewmen are wearing the short "Whites" popular in the tropics. 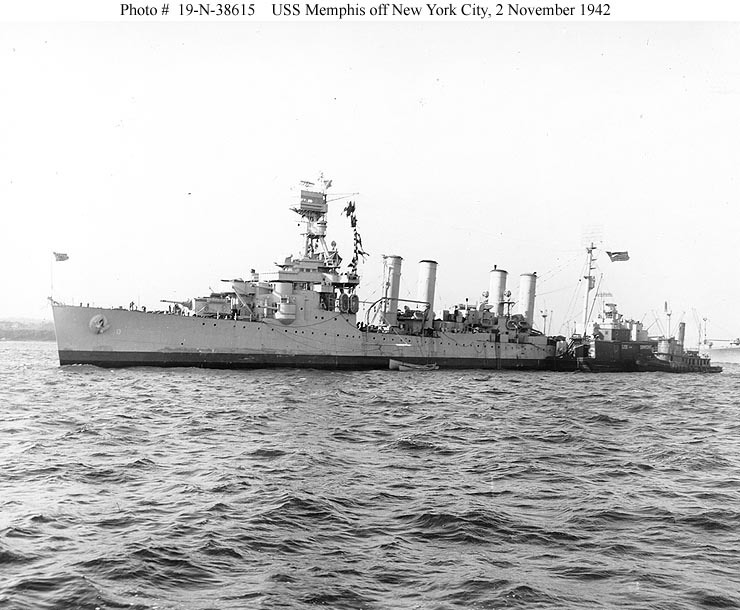 Official U.S. Navy Photograph, now in the collections of the National Archives #80-G-10535. 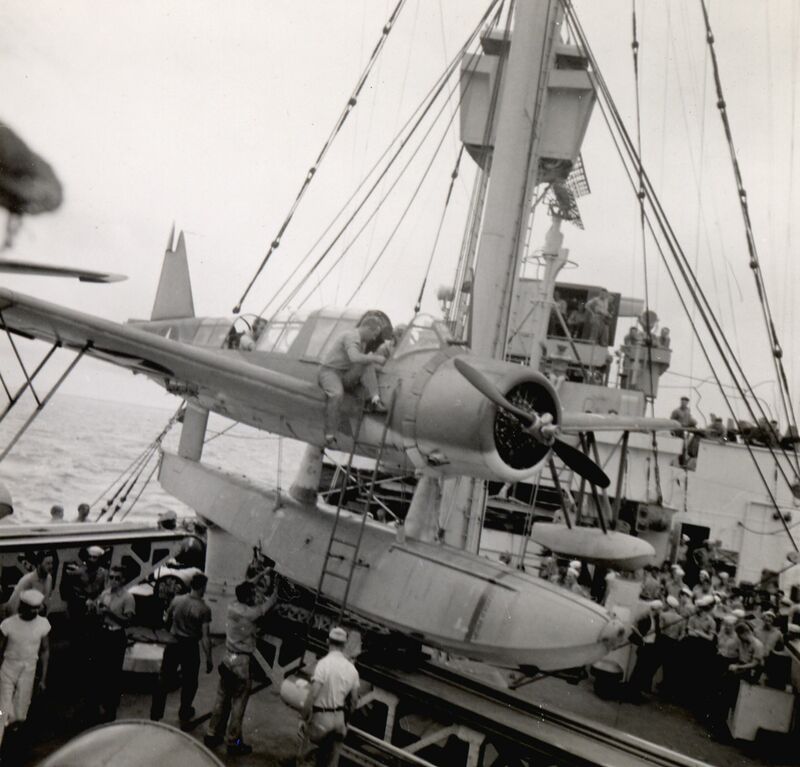 USS Memphis (CL 13) A Curtiss SOC "Seagull" scout-observation aircraft hooks onto the recovery mat, in preparation for being hoisted on board, circa early 1942. 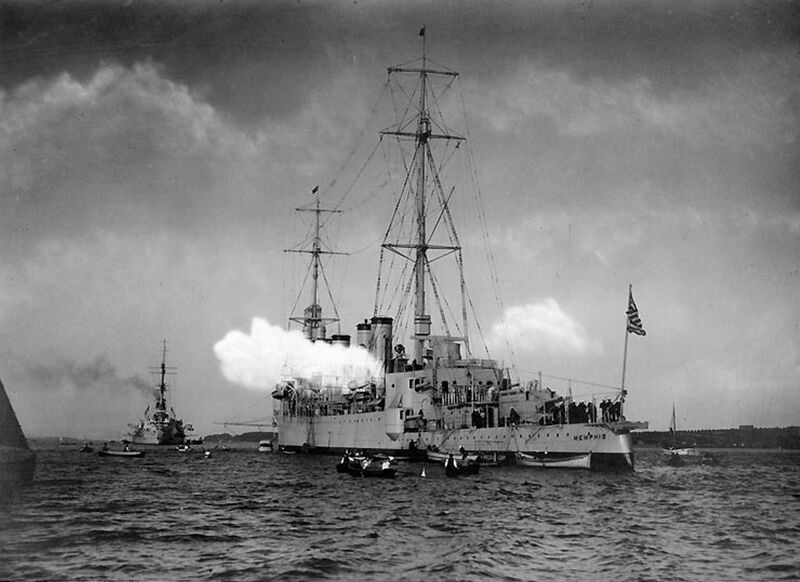 Note flags marking the mat's front edges, and men watching from the whaleboat in the lower right. 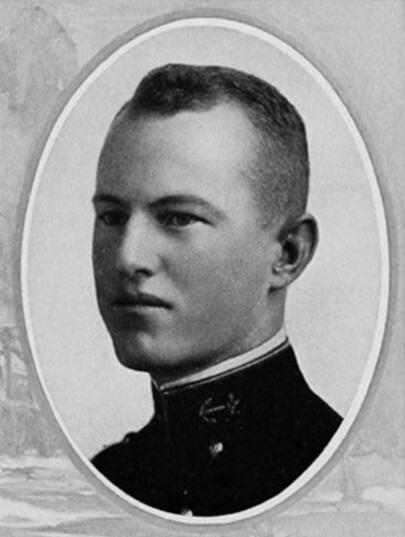 Official U.S. Navy Photograph, now in the collections of the National Archives #80-G-21927. 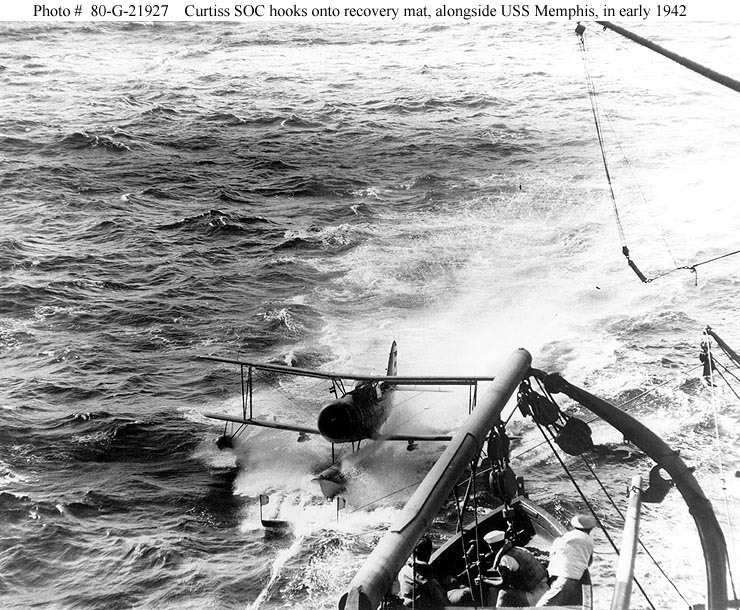 USS Memphis (CL 13) A Curtiss SOC "Seagull" scout-observation aircraft is lowered onto the cruiser's starboard catapult, after recovery, circa early 1942. 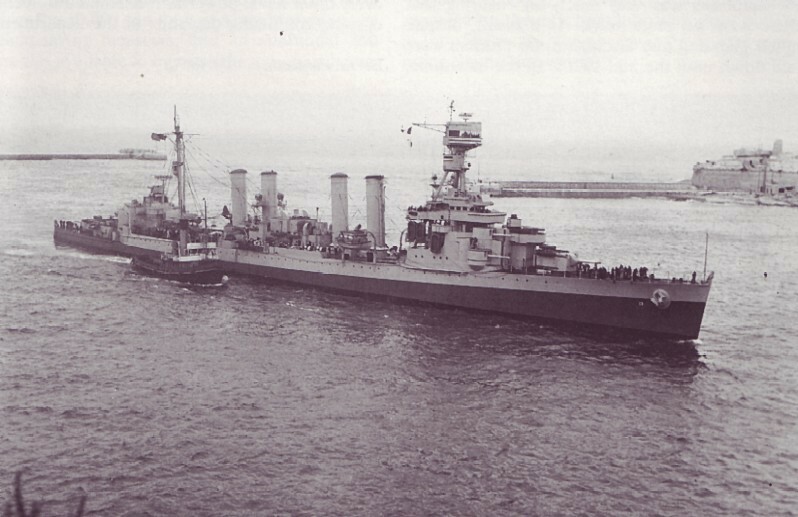 Note crewmen wearing tropical white uniforms, searchlights alongside smokestacks, 3"/50 anti-aircraft guns in front of the catapult and .50 caliber machine guns behind it. 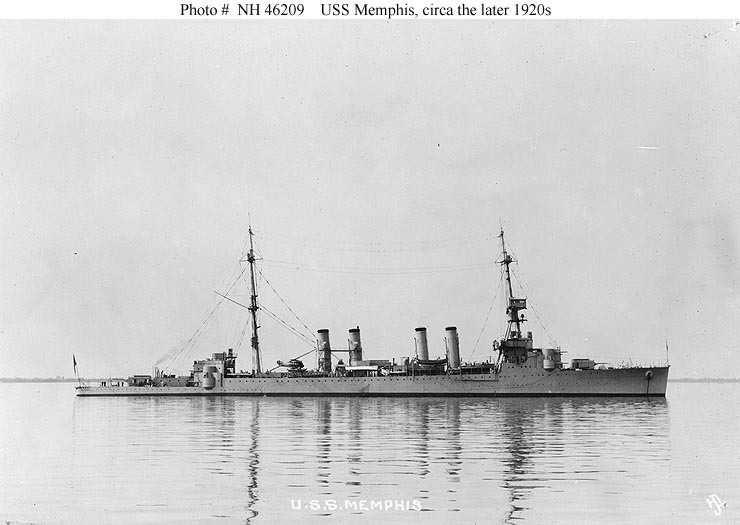 Official U.S. Navy Photograph, now in the collections of the National Archives #80-G-21925. 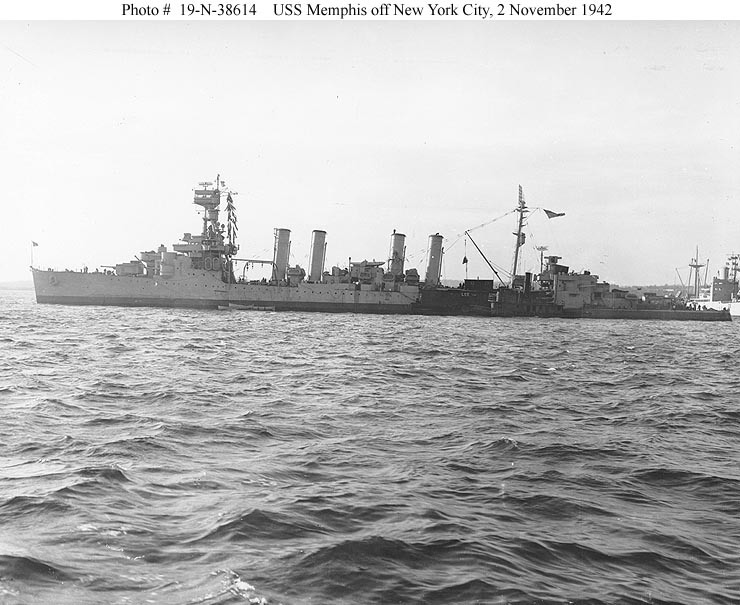 USS Memphis (CL 13) Off New York City, 2 November 1942, with a barge and harbor tug alongside. 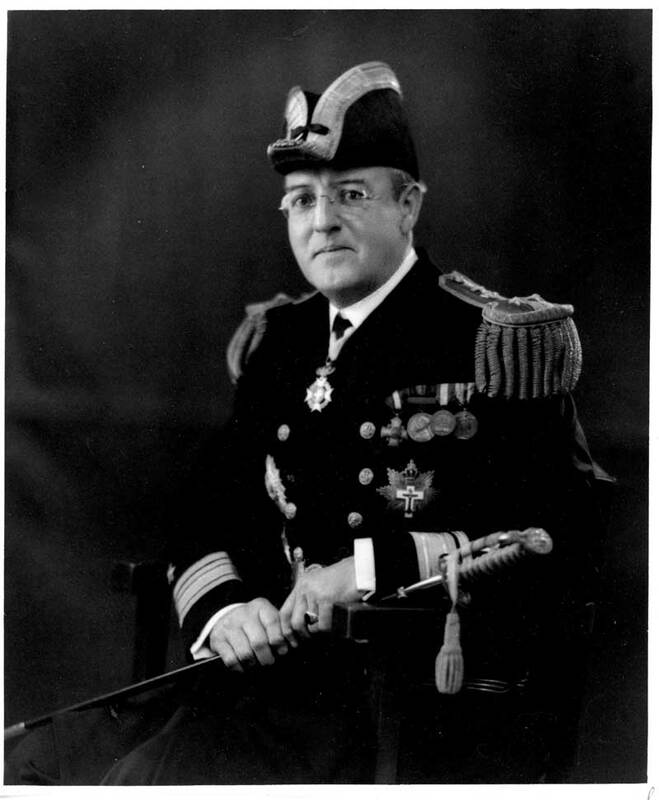 Photograph from the Bureau of Ships Collection in the U.S. National Archives #19-N-38615. 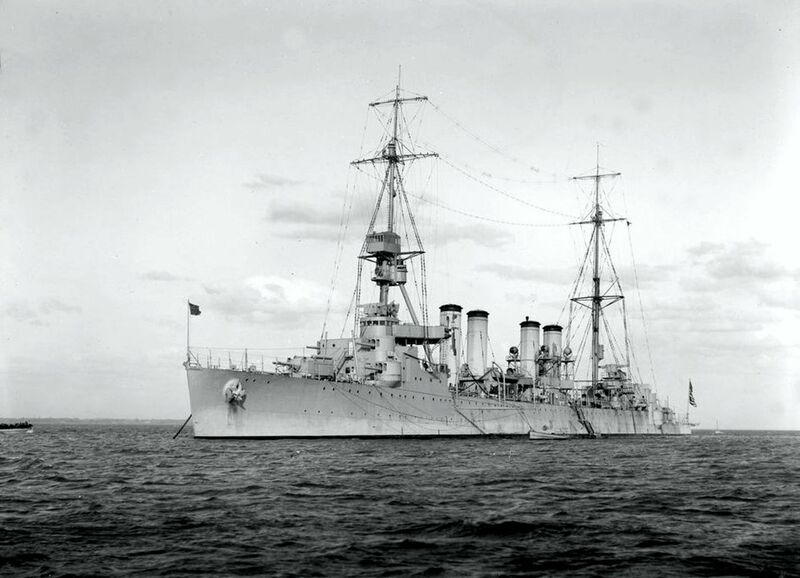 Photograph from the Bureau of Ships Collection in the U.S. National Archives #19-N-38614. An OS2U Kingfisher floatplane preparing for launch. From the collection of PhoM1c Owen Nance. Moored somewhere in the Mediterranean, 19 August 1945.